These diseases of the heart that are present from birth and, depending on their severity, occur at some point in life, from infancy until adulthood. Approximately 1% of newborns have some form of congenital heart disease. Thanks to early diagnosis and the advancement of medical science, the majorities of children with congenital heart disease survive and become adults, which results in a population of adults with congenital heart disease exceeding that of children, today. They are due to some abnormality or retardation of fetal development. Most often they are of unknown etiology. Factors associated with pregnancy such as infections, exposure to radiation, medications, alcohol abuse, smoking, and hereditary predisposition increase the risk of congenital heart disease. In the neonatal-infantile age, it is important to notice central cyanosis (most noticeable on the lips), the onset of tachypnea and tachycardia, and abnormal feeding behavior (if the child has trouble in drinking milk, if it gasps, it sweats or often stops and falls asleep). Children may have delayed physical development, a fainting episode, fatigue or frequent respiratory infections. Similar symptoms occur in adults with congenital heart disease who, however, may have additional symptoms, associated with degenerative heart diseases (i.e., coronary artery disease, arrhythmias, hypertension, etc.). It is worth noting that, in many cases, patients with congenital heart disease have no symptoms. Congenital heart disease is typically diagnosed by echocardiography, which ideally should be done by a cardiologist familiar with these disorders. Today it is possible to do prenatal diagnosis by performing echocardiography in the fetus. Moreover, often an MRI or rarely cardiac catheterization is needed. Most patients with congenital heart disease are treated surgically. Approximately 10-20% of patients have mild disease (mild stenoses or small communications) and do not require treatment; they only need monitoring. Finally, many congenital heart diseases (> 20%) are treated in the cath lab, by catheterization of the heart, after local anesthesia, without the need for surgery. In some cases surgery may be dome initially and then, after several years, a second catheter-based operation can follow. The progress of interventional cardiology has allowed us to perform more and more percutaneous interventions (without surgery) for congenital heart disease. 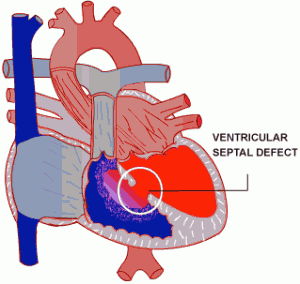 The most common intervention is the closure of an atrial septal defect.